Visiting temples is one of the highlights of any trip to Thailand. Their ornate pagodas and golden statues make them must-see attractions, and there are many options for visitors to choose from. Thailand is home to about 40,000 temples, several thousand of which are located in Bangkok alone. It would be easy to simply temple-hop in the capital city, limiting your visit to the heavily-trafficked Wat Pho and Wat Arun — which are certainly worth seeing — but in a country replete with beautiful temples, it’s worth it to venture away from the city. Whether it’s the White Temple of Chiang Rai in the north or the unfinished Sanctuary of Truth south of Bangkok, Thailand is full of unforgettable temples. Here are seven you need to check out. 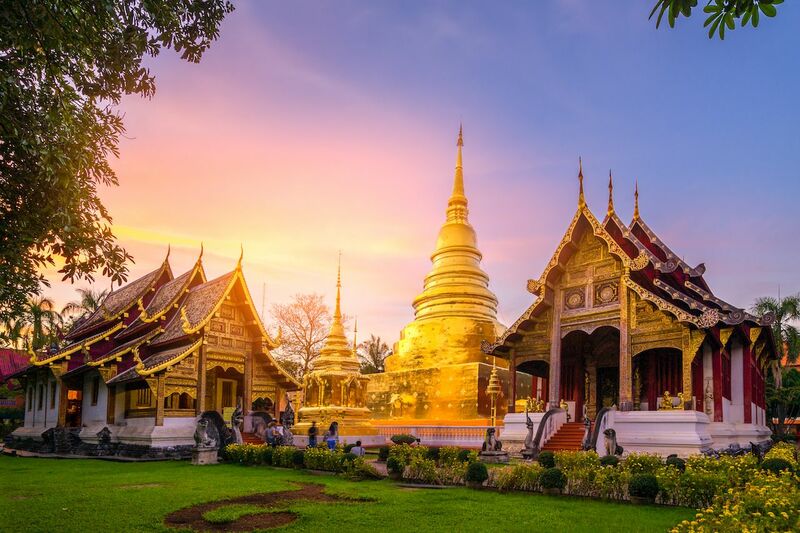 10 hours north of Bangkok, located amid the country’s highest mountains, the city of Chiang Mai is home to Wat Phra That Doi Suthep. Built in 1386, the temple sits atop the Doi Suthep mountain, which you’ll need to climb if you want to see this golden beauty up close. But don’t worry, you won’t have to hoof it — you can hire a motorbike or take a taxi. Outside the temple itself you’ll also find a statue of a white elephant, which represents the animal that is said to have born a sacred Buddhist relic to the top of the temple in 1368. 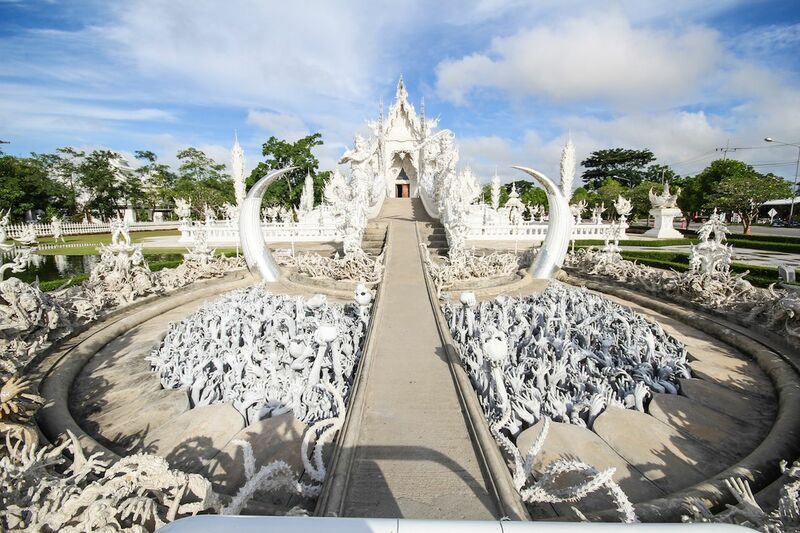 In Chiang Rai, close to the border with Laos, Wat Rong Khun is otherwise known as the “White Temple.” Not quite as ancient as the rest of Thailand’s temples, it’s no less magnificent. 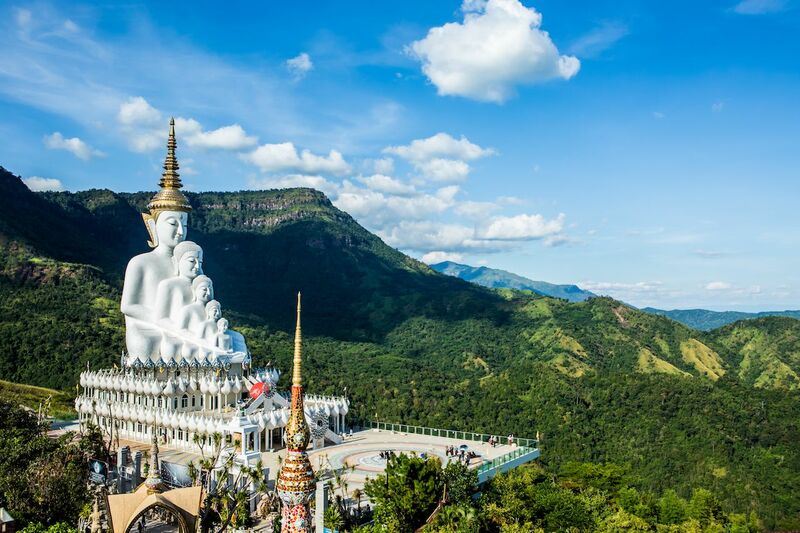 Constructed in 1997 in the province of Chiang Rai, the temple is notable for its unconventional look — it’s completely white and covered in intricate carvings. To reach the temple, you need to cross a bridge over a creepy “pond” filled with hands, reaching skyward for air. While most temples are heavily decorated with gold and other colors, Wat Rong Khun is also strikingly different inside; instead of the traditional Buddha statues, there are murals representing samsara — the realm of rebirth and delusion. Depictions of Elvis, Superman, and The Matrix, might seem out of place in a Buddhist Temple, but they’re all part of what make Wat Rong Khun so unique. 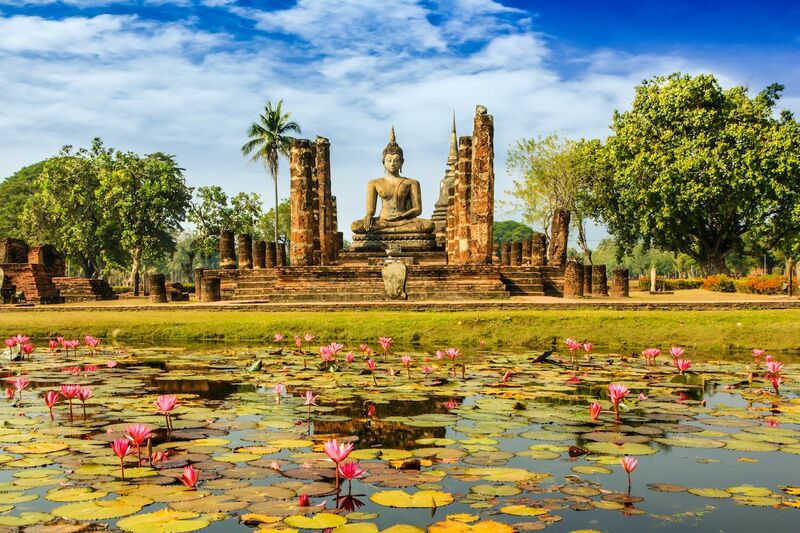 An easy ride north from Bangkok — about an hour and a half by train — Ayutthaya is the former capital of Thailand, and home of an ancient temple complex. 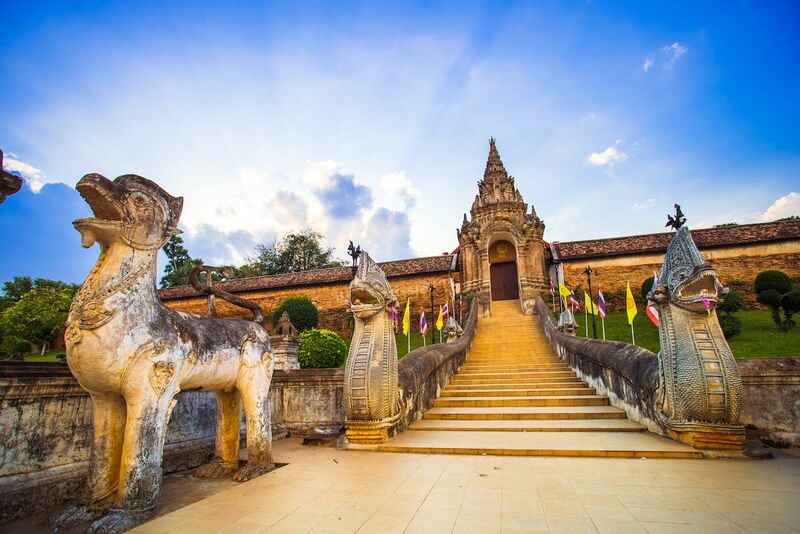 A UNESCO World Heritage Site, the park is composed of 67 temples and ruins dating back to 1351. The park includes sacred stone Buddha statues, as well as impressive stone courtyards and palaces. One of its most popular attractions, in Wat Mahathat, one of the temples, is a Buddha head entangled within the roots of an ancient tree. About two hours north of Bangkok, Lopburi used to be one of Thailand’s largest and most important cities; now it’s home to the ruins of palaces and temples built between the sixth and 10th centuries. What really sets it apart from other temples, however, are the hundreds of macaques who pretty much have free reign over the city. 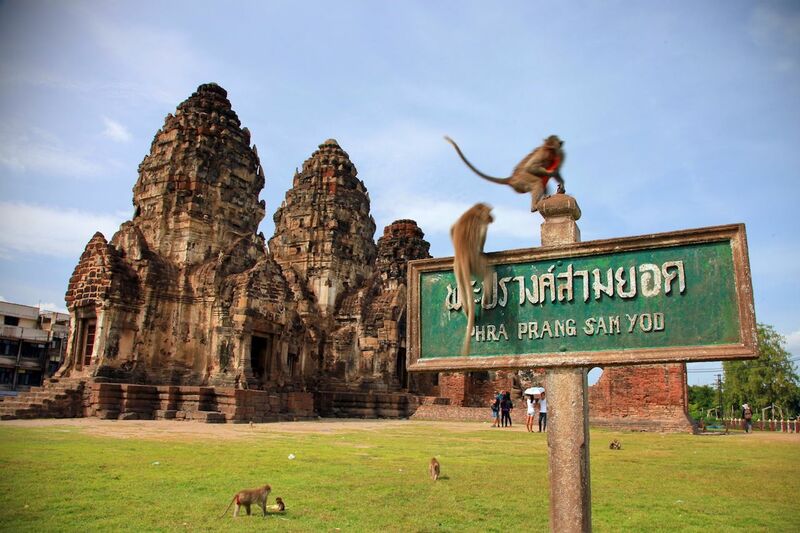 The furry creatures have made their home among the ruins, particularly the remains of Phra Prang Sam Yod temple, which is known as the “Monkey Temple.” So, if the idea of your shoulder (or head) becoming a monkey perch makes you uncomfortable, you may want to think twice about visiting. The monkeys are fairly mischievous, and have been known to climb tourists’ legs, steal their belongings, and even scratch or bite. Visitors are advised not to wear valuable jewelry here, or anything that could be easily snatched. One of the most sacred sites in all of Thailand, Wat Phra That Lampang Luang was built in the 13th century, and is completely preserved in its original state. According to legend, the Buddha visited the site 2,500 years ago and donated a strand of his hair, which is now enshrined in the temple. In addition to the temple itself, the site is also home to the oldest-surviving wooden viharn (sermon hall) in Thailand, and other holy wooden structures. The temple grounds are seven hours north of Bangkok, about an hour and a half south of Chiang Mai, and can be easily reached from Lampang town by taxi. Wat Pha Sorn Kaew isn’t just a temple — it’s one of the best views in Thailand. Perched atop a 2,700-foot peak, it offers a stunning view of the surrounding mountains and forests. The temple itself glitters with over five million mosaic and pottery pieces, and is famous for its five massive, white Buddha statues, standing tall against the backdrop of towering mountains. You’ll also find a stained glass gazebo and several peaceful gardens on the grounds. The tranquility of the place is truly unmatched by any other temple in Thailand. As it’s relatively unknown to tourists, you won’t be bothered by huge crowds here, and can roam the site at your own leisure. Most choose to hire a taxi to the peak, but visitors can easily hike to it. Wat Pha Sorn Kaew is located near the town of Khearn Sorn, a five hour drive north of Bangkok. The Sanctuary of Truth in Pattaya has been under construction since 1981 with no end in sight. About two hours south of Bangkok, and right on the Gulf of Thailand, the complex is a visionary project dedicated to Thai, Khmer, Chinese, and Indian religious iconography, and is meant to preserve ancient, endangered building techniques. 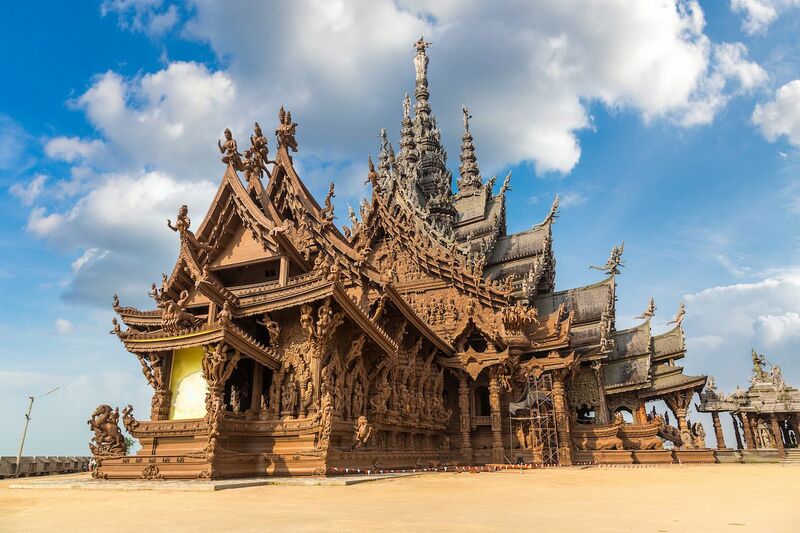 Made entirely of wood, the building is completely covered in carvings of Hindu and Buddhist gods and goddesses — a collage of centuries of religious myths. The site also hosts shows and activities, such as sword fighting and traditional dancing, but avoid the elephant riding at all costs. Despite its incomplete state, tours of the building are offered regularly, departing every 30 minutes.